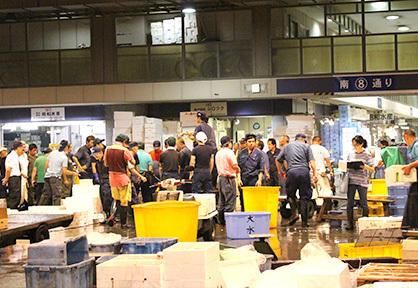 DAISUI’s head office is located at Osaka Honjo fish market which is the 2nd largest fish market in Japan, next to famous Tsukiji of Tokyo. We have total 7 branche offices : three in Osaka, two in Kobe, Kyoto, Akashi. Fresh fish & all kinds of fishery products coming from Japan & the world are once gathered to our markets and those will be delivered to consumers, home to home, via many professional fish dealers, and DAISUI is playing a vital role of its distribution as an reliable wholesaler. 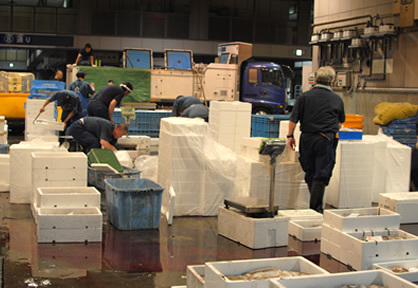 Although our main business is based on domestic wholesaler, we also export frozen fish (Japan Origin) to abroad. Copyright (C) Daisui.Co.,Ltd. All Rights Reserved.